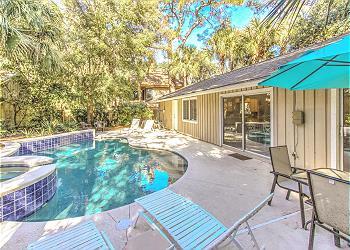 Delightful 3rd row South Forest Beach vacation home with private *heated pool and spa. 4 bedroom, 3 bath The open floor plan provides a comfortable and spacious house ideal for any family vacation! The living room, dining room, and kitchen are on the 1st floor with easy access to the expansive pool deck, spa, outdoor dining area, and gas grill. Three of the bedrooms are conveniently located on the first floor as well. The first bedroom features a king bed and a private bathroom with a Jacuzzi tub and shower combination. The second bedroom has a queen bed and shares a hall bath with the third bedroom with 2 twin beds. The impressive master suite is located on the second floor. It has a king size bed with a comfortable sitting area, private bath, and a spacious walk-in closet. Outside the master bedroom is a cozy den with sleeper sofa. The home has private beach access with convenient secluded parking away from the bustle of the main tourist areas allowing your family and friends to enjoy a peaceful environment. •	Private *heated pool and spa (23 x 12) *This pool & spa have a gas heater and can be heated for an additional fee of $575-$875 + tax per week depending on the season. If you would like to heat the spa only, the cost per week is $225 + tax.